Considered to be one of the better smartwatches available, and my personal favorite, the Samsung Gear S3 received a substantial update today. Dubbed "Value Pack," it brings both the Classic and the Frontier to Tizen 3.0.0.1, as well as a bunch of new stuff. As you can see, this is a huge update. I've spent the day finding interesting little tidbits, like how there's a Clear All option in the notifications now, or that you can look for and download apps from the Galaxy Apps store directly on the watch. Everything seems faster and smoother now — notifications appear faster, instead of taking several seconds to actually show me what I need to know. Samsung has a few areas that it's focusing on in this update. The first is the improved (or maybe overhauled) exercise and health tracking. Like you saw in the changelog, real-time heart rate monitoring is available, which could be useful if you're into that sort of thing (hint: I'm not, and I never wear my Gear S3 to the gym). Finally, leave it to Samsung to add something that feels superfluous. As the company explains it, users can now "watch exercise programs from their synced smartphone on a TV. 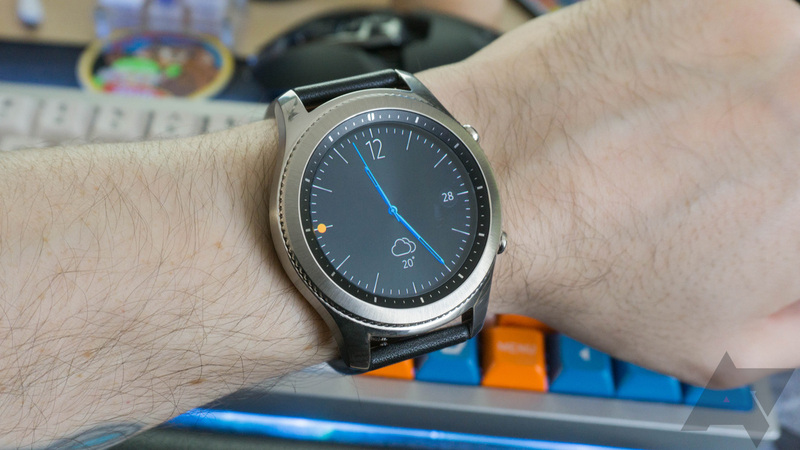 Once connected, they can use their Gear S3 to control the displayed content, display their heart rates on the TV." Alrighty, then. Communication is a big part of this update, it seems, with users able to create events (with pertinent info like time, date, location, etc.) or add contacts to their address book straight from the watch. Checklists, video, and web reminders synced from the host smartphone are also viewable on the watch now. The given example is that you create a grocery list on your phone, which then syncs over to the Gear S3, meaning that you can check off items on the watch instead. I'm down with that, but it's of course limited to the S8/S8+ and the Note 8. The UI is receiving some nice changes, like new icons, a more efficient quick settings shade, and widget improvements. In its blog post, Samsung talks about how widgets now have a band surrounding them, offering extra info like the time remaining on a song, how long before an alarm goes off, or something like that — super awesome, right? Turning the bezel at varying rates determines whether you see more or less information on a given item; for instance, twisting the bezel on a notification like a text opens the quick reply menu with your pre-defined messages. Okay, so we finally reached the end. Samsung shoved a ton of stuff into the Value Pack update, and I'm still finding everything it has on offer. I'm excited for the prospect of Samsung Connect for SmartThings, and I am really liking the UI changes. If you haven't received the update, be sure you have the latest version of the Gear Manager (which also received a visual refresh) and to check for the update in the app's settings.